Above all else, the goal of cochlear implants is to create a useful interface between the electrode array and the neural structures of cochlea—to create a bridge between technology and nature. If the electrode array cannot effectively stimulate the cochlea, there is a bottleneck in the communication pathway. Any benefit of front-end processing or assistive listening accessories would be, in effect, hobbled by a comprised connection between the implant array and the auditory nerve. Considering the entire purpose of a cochlear implant relies on the quality of this interface between electrode array and the cochlea, there is an astounding contrast in the outcomes between different electrode designs. Basically, in tip fold-over or tip rollover, the electrode array folds over upon itself. This seriously compromises the interface between the electrode contacts and the cochlea, and often limits coverage to less than ¾ of a single turn in the cochlea. Extensive research has shown that tip fold-over with MED-EL arrays is practically non-existent. 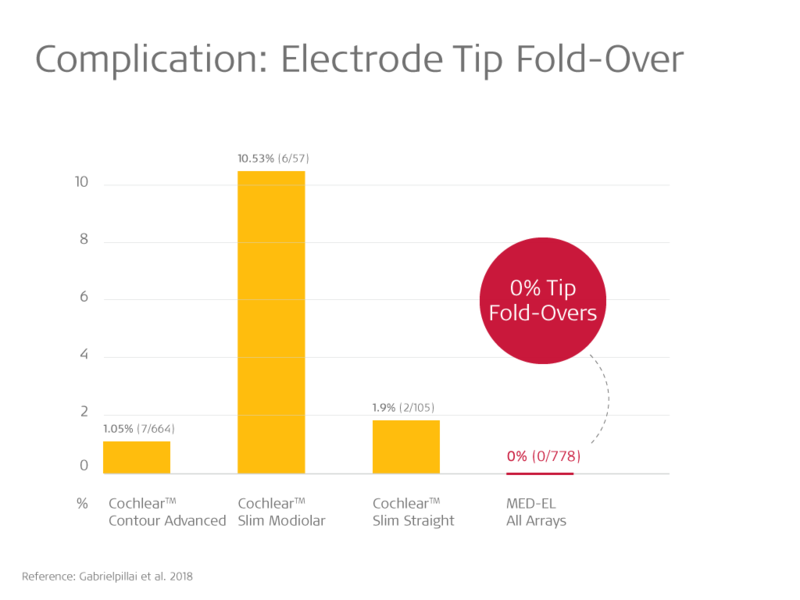 Let’s look at why tip fold-over is not an issue with MED-EL, how you can detect tip fold-over with other arrays, and the implications for cochlear implant surgeons, audiologists, and patients. How can you avoid electrode tip fold-over? As this complication has been frequently reported even by experienced surgeons, the best course of action may be to avoid using electrode designs that are prone to folding over. Most importantly, we can look at the evidence. Gabreilpillai et al. (2018) recently published an extensive retrospective analysis of 1,320 cochlear implant recipients (1,722 ears) with post-operative imaging. The University Hospital Frankfurt is a large academic center with experienced surgeons. Of course, many centers may not have CT or DVT immediately and conveniently available for every CI procedure. In any case, needing to transfer the patient to radiology intraoperatively is not considered an ideal workflow. Furthermore, many instances of tip fold-over are not detected until post-operatively. Without surgical revision, overlapping electrode contacts need to be deactivated. This limits stimulation range and significantly impacts hearing outcomes and patient benefit.1,2,3,4 On the other hand, returning to the OR for revision surgery in the days or weeks following implantation would also be a significant burden for both patients and clinicians. The purpose of a cochlear implant electrode array is to provide a precisely positioned interface to the intricate neural structures of the cochlea. 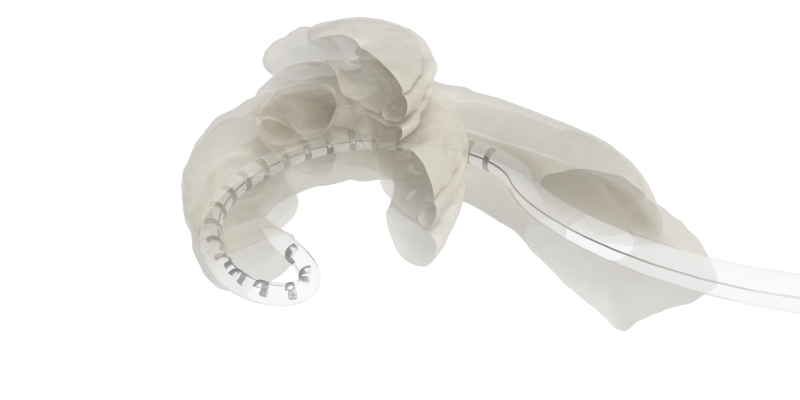 That’s why MED-EL arrays are specifically engineered to deliver reliable scala tympani placement and complete cochlear coverage for the closest possible match to natural hearing for your patients. Want to learn what makes MED-EL arrays the most flexible and atraumatic arrays available? Check out this in-depth discussion of structure preservation with FLEX electrode arrays. Have a question about MED-EL electrode arrays? Let us know with our simple contact form! Don’t forget to subscribe to get all the latest MED-EL Professionals Blog articles sent right to your inbox! Gabrielpillai, J., Burck, I., Baumann, U., Stoever, T., Helbig, S. (2018) Incidence for Tip Foldover During Cochlear Implantation. Otology Neurotology, 39(9): 1115–1121. McJunkin, J.,L., Durakovic, N., Herzog, J., & Buchman, C.,A. (2018) Early Outcomes With a Slim, Modiolar Cochlear Implant Electrode Array. Otol Neurotol. 39(1):e28-e33. Zuniga, M.G., Rivas, A., Hedley-Williams, A., Gifford, R.H., Dwyer, R., Dawant, B.M., Sunderhaus, L.W., Hovis, K.L., Wanna, G.B., Noble, J.H., & Labadie, R.F. (2016) Tip fold-over in cochlear implantation: Case series. Otol Neurotol. 38(2):199–206. Cosetti, M.K., Troob, S.H., Latzman, J.M., Shapiro, W.H., Roland, J.T. Jr., & Waltzman, S.B. (2012) An evidence-based algorithm for intraoperative monitoring during cochlear implantation. Otol Neurotol. 33: 169–176. Grolman W, Maat A, Verdam F, et al. (2009) Spread of excitation measurements for the detection of electrode array fold-overs: A prospective study comparing 3-dimensional rotational x-ray and intraoperative spread of excitation measurements. Otol Neurotol 30:27–33. MED-EL data on file. Based on retrospective analysis of post-operative imaging of 216 MED-EL implants from multiple centers. Wanna, G.B., Noble, J.H., Carlson, M.L., Gifford, R.H., Dietrich, M.S., Haynes, D.S., Dawant, B.M., & Labadie, R.F. (2014). Impact of electrode design and surgical approach on scalar location and cochlear implant outcomes. Laryngoscope. 124(6):1–7. O’Connell, B.P., Cakir, A., Hunter, J.B., Francis, D.O., Noble, J.H., Labadie, R.F., Zuniga, G., Dawant, B.M., Rivas, A., & Wanna, G.B. (2016). Electrode location and angular insertion depth are predictors of audiologic outcomes in cochlear implantation. Otol Neurotol. 37(8):1016–1023. Boyer, E., Karkas, A., Attye, A., Lefournier, V., Escude, B., & Schmerber, S. (2015) Scalar localization by cone-beam computed tomography of cochlear implant carriers: A comparative study between straight and periomodiolar precurved electrode arrays. Otol Neurotol. 36(3):422–429. Nordfalk, K., Rasmussen, K., Hopp, E., Bunne, M., Silvola, J.T., & Jablonski, G.E., (2016). Insertion Depth in Cochlear Implantation and Outcome in Residual Hearing and Vestibular Function. Ear Hear. 37(2):e129–137.